Hope Next Exit is back. 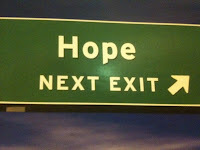 Actually 'Hope Next Exit' never really left and is a mantra I try to live by as it pertains to fighting cancer. The Hope Next Exit Raffle is back. If you are not familiar with the birth of this Hope Next Exit picture on the left, it began late 2009 when my wife was diagnosed with cancer a second time. For those familiar with my entire story, please bare with me while I briefly share it for those that arrived to this post without the full story. I go through life assuming everyone knows my story because I have shared it so many times. Recently, however, I have been reminded on several occasions that the masses are not familiar with my story. By recent, I literally mean yesterday based on interaction with Michelle Jacobs (@BklynRunner on Twitter). We have chatted in passing on Twitter and share common Twitter friends so I assumed she was well aware of my losses. Yesterday, I was sad to see that Michelle's Mom, Ida Jacobs, was not doing so well. I reached out to see if I could help and we exchanged a lot of messages. Ultimately I learned that Michelle's Mom was deep in sleep and had been the entire day. This was a mirror image of my father's last day before passing. What our respective parents also shared was that they each had leukemia. Anyway, I offered what I could to help and I shared a very personal story and could only hope it helped. That really is why I share my story....hoping it helps someone in a similar circumstance or someone that has been through trying times and needs to know there is an amazing future beyond hardship. It usually does and that is one of the many blessings that comes out of the my experience. Unfortunately Ida passed away last night. My prayers are with Michelle and all of Ida's friends and family. Mom is now an angel...pain free and dancing. I will keep her and this story close to my heart as I push towards Ironman Wisconsin on September 11, 2011. Back to the short but full version of my story. Over a 15 month period of time beginning late September 2002, my father was diagnosed with leukemia. While he was fighting, my wife Crea became pregnant with our first child together, Isabella Soleil Wilno. In August, 2003, Isabella passed straight from the warmth and comfort of being with Mom for nine months to God. She passed away at birth and shortly after, my Dad was told treatment would not help. I moved out to be with my parents until he passed which took place in January 2004. Shortly after, while pregnant again, my wife was diagnosed with cancer. We had the tough decision of fighting the cancer first or giving birth to our son Jaden first. We opted for the latter.......my son was born a healthy and fat child....two weeks later my wife was dealing with all the things that come with fighting cancer. She beat it. She is tough. Almost 5 years to the day later, we were back at the doctor thinking we were beyond this cancer forever. Instead, the doctor told us the cancer had returned. 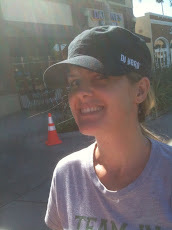 My wife beat the cancer a second time in early 2010. 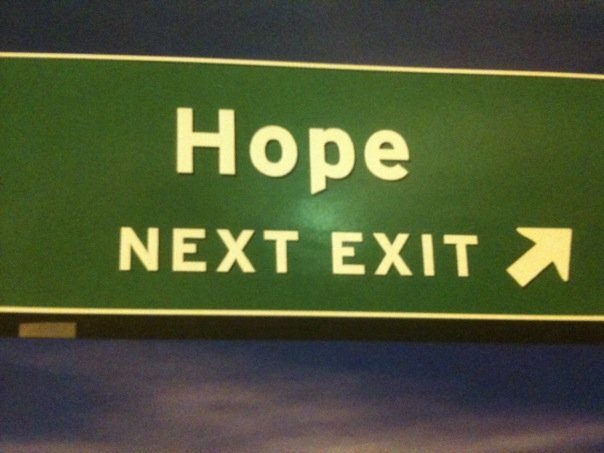 Along the journey we met with various surgeons and in one particular waiting room (which I like to call the 'Theater of Good News to Come), I saw the 'Hope Next Exit' picture above. It became our fighting words. After her successful second battle with cancer, we threw a party called Hope Next Exit and I launched the first raffle. I will do my best to cut off the raffle at 250 but it may go slightly over. I have mailed letters out about the raffle so I have no idea what money is in transit. My goal is to be as close to 250 as possible so your chances of winning are as advertised. THANKS TO ALL FOR EVERYTHING OVER THE YEARS. I DID NOT RAISE $93,000 WITHOUT AMAZING SUPPORT. THANK YOU FOR HELPING TO PUSH ME TO THE FINISH LINE OF MY $100,000 GOAL AND FOR PUSHING THE WORLD TO THE FINISH LINE WHERE THE END OF CANCER IS CELEBRATED. I DO NOT DRINK. I WILL HAVE AN AMAZING GLASS OF RED WINE ON THAT DAY. MY DAD IMPORTED WINE. HE WOULD APPROVE. Hi Chris, I'm trying to locate you to see if you could help me spread the fundraising news for TNT NORCAL. I am having a wine tasting even in Thousand Oaks, and wanted to send you an evite!